Guitar to Slide Guitar Conversion Pack - Nut Conversion, Aluminum Guitar Slide & Elmore James – Master of the Electric Slide Guitar Book by Slide Guitar Conversion Kits at Crossroads Philadelphia. MPN: SGP-5. Hurry! Limited time offer. Offer valid only while supplies last. Guitar to Slide Guitar Conversion Pack includes: Nut Conversion, Aluminum Guitar Slide & Elmore James - Master of the Electric Slide Guitar Book. Guitar to Slide Guitar Conversion Pack includes: Nut Conversion, Aluminum Guitar Slide & Elmore James - Master of the Electric Slide Guitar Book. Elmore James - Master of the Electric Slide Guitar-Tab transcriptions and lessons for 18 Elmore James classics: Dust My Broom • Elmore's Contribution to Jazz • Everyday (I Have the Blues) • I See My Baby • I Was a Fool • It Hurts Me Too • Madison Blues • One Way Out • So Mean to Me • The Sun Is Shining • Tool Bag Boogie. Supernova Aluminum Bottleneck Guitar Slide-This Aluminum Bottleneck Guitar Slide by Supernova produces a clean, bright cutting tone with great sustain. Today's most popular slide is lightweight and perfect for electric guitars. Processed from high quality durable aluminum. Supernova Slides are the guitar slide chosen by popular guitarists! 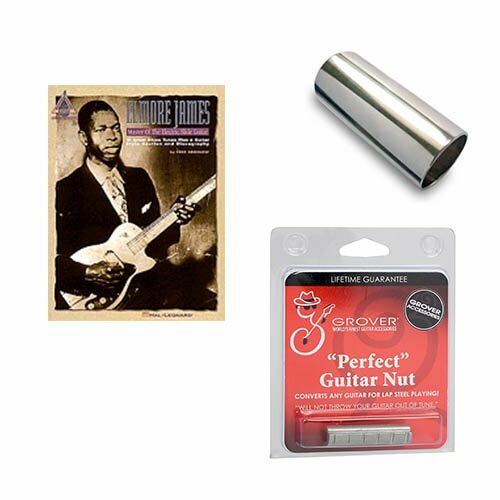 The Grover "Perfect" Guitar Nut converts any guitar for lap steel playing, and will not throw your guitar out of tune! This extension nut fits over the existing nut to raise the action for slide playing. It comes with a lifetime guarantee, and the quality you've come to expect from the Grover name. Guitar to Slide Guitar Conversion Pack includes: Nut Conversion, Aluminum Guitar Slide & Elmore James - Master of the Electric Slide Guitar Book. Elmore James - Master of the Electric Slide Guitar-Tab transcriptions and lessons for 18 Elmore James classics: Dust My Broom • Elmore's Contribution to Jazz • Everyday (I Have the Blues) • I See My Baby • I Was a Fool • It Hurts Me Too • Madison Blues • One Way Out • So Mean to Me • The Sun Is Shining • Tool Bag Boogie. Supernova Aluminum Bottleneck Guitar Slide-This Aluminum Bottleneck Guitar Slide by Supernova produces a clean, bright cutting tone with great sustain. Today's most popular slide is lightweight and perfect for electric guitars. Processed from high quality durable aluminum. Supernova Slides are the guitar slide chosen by popular guitarists! The Grover "Perfect" Guitar Nut converts any guitar for lap steel playing, and will not throw your guitar out of tune! This extension nut fits over the existing nut to raise the action for slide playing. It comes with a lifetime guarantee, and the quality you've come to expect from the Grover name. If you have any questions about this product by Slide Guitar Conversion Kits, contact us by completing and submitting the form below. If you are looking for a specif part number, please include it with your message.